Please note this is a general overview intended to help players coming into Rugby League that may be more familiar with the 15 man code. It is not a definitive guide to either game, just a helping hand for new players. BESIDES the number of players (13 for League and 15 for Union), the major differences between the two codes centers around the tackle, and what happens after it. After the tackle, players in union contest possession, and depending on what the situation is, a ‘ruck’ or a ‘maul’ takes place. League players though, don't contest possession after a tackle and play resumes with a ‘play-the-ball’. The six tackle rule applies in League, while in Union, it doesn't. This is basically where a team surrenders possession when it doesn’t score before the end of a 'set-of-six'. In Union, a team may keep possession for an unlimited number of tackles before they score, as long as they keep the ball and no infringement is committed. As a result of the six tackle rule League also has the ten-meter rule. After each tackle the defending side, all bar the two 'markers', must retreat 10 meters to allow the attacking side room to advance. Once the play-the-ball has occurred the defending side can close the gap and meet the attack. The result is a high impact game with greater speed in the collision. Union has the ‘scrum’ and the ‘lineout’ as set pieces. 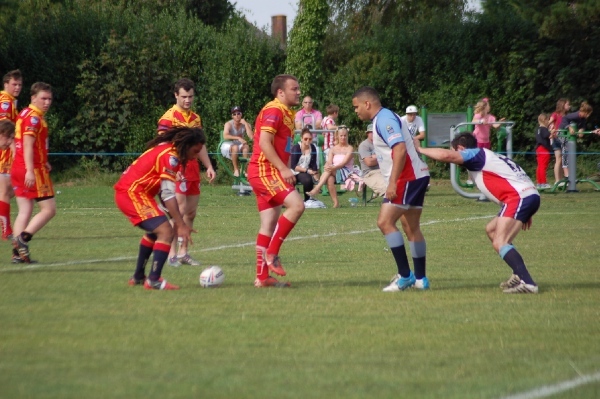 The scrum involves opposing players pushing against each other for possession of the ball, and the lineout is where players from either team line up parallel to each other, facing the touch-line, and then try to catch the ball when it is thrown from ‘touch’. League also has the scrum, but with far less importance, and it is not often contested. 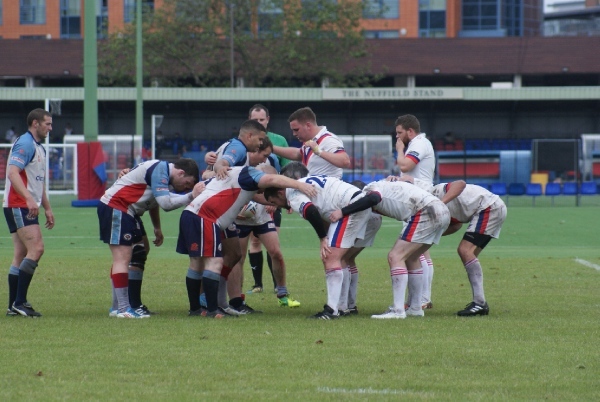 Fewer players make up the scrum in League and set pieces start from play-the-ball scenarios. The scrum in League is much less prone to frustrating technical infringements and allows open play to resume immediately. Union is often referred to as the more technical code but in reality the two sports technical intricacies are of similar levels, however in League the focus is always on getting the game flowing again so the number of scenarios where technical infringements can occur at set plays has been actively reduced. League therefore suffers less instances of restarted or reset set-plays. Both codes have now outlawed the shoulder charge tackle. League also has the 40-20 rule. If a player is standing on or behind their own 40-metre line, they can gain ground by kicking the ball into their opponent's 20-metre area. However, the ball has to bounce in the field of play before going out to touch inside the 20m area. Play re-starts with the attacking side having head and feed at the scrum. The 40-20 rule is not generally used in amateur Rugby League due to the difficulty of adjudicating it. For both Union and League, positions share names and requirements, but League does not have the flankers that appear in union. The flankers were dropped from League to increase space on the pitch and create a more open game. A try in Union is worth 5 points, a conversion 2 points, a penalty and field goal are both worth 3 points. In League a try is 4 points, the conversion is 2 points, a penalty is also 2 points and a field (drop) goal is worth 1 point. Union's scoring system is not as bias towards try scoring as League's is. League puts the focus on accruing points predominantly through the perceivably harder act of scoring tries, rather than by means of kicks at goal. League has 13 players, Union has 15 players. League has the six-tackle rule, Union does not. League has the ten meter rule, Union does not. League has got no flankers.